Who says you can't eat like a queen on a work night? This meal takes inspiration from Thai food, though no serious Thai cook would recognize it as such. It's the perfect combination of savory and sweet. It's moreish, like eating dinner and dessert at the same time. It looks incredibly appetizing and it takes about half an hour to make. If you're not sharing it, you'll have plenty of leftovers. It's equally good hot, warm, or at room temperature. 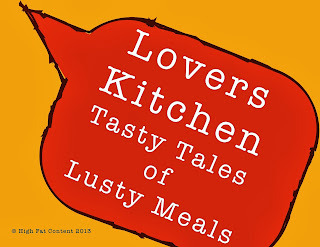 Few meals can live up to such a claim. By all means you can easily make your own chili sauce and I often do, but not on a work night. Prepared Thai chili sauce is absolutely fine. I usually go for one with heat, marked "hot." If you'd rather not have that much heat with your noodles, go with a medium. Avoid mild as it's too sweet and cloying. * Medium Dried Egg Noodles - 500g/about a pound. * If you prefer, substitute egg noodles for Japanese style buckwheat noodles. I like buckwheat, but they are prohibitively expensive in my part of the world. Dried egg noodles, on the other hand are a bargain. ** Kaffir Lime Leaves are optional. They infuse the hot water with a wonderful fragrance that gently permeates the noodles. Remove fish from fridge and unwrap about an hour before roasting. This allows it to reach room temperature before cooking. Wash and slice lemons into circles. Set aside. Peel and slice shallots into quarters. Set aside. Preheat oven to 200c / 400f. Spread olive oil on base of large baking tray. Roll shallots in the oil, then push to one side. Place salmon on tray, skin side down. Sprinkle generously with coarse salt and pepper. Top with the sliced lemons. Toss the lightly oiled shallot pieces on top.These will brown and darken beautifully. Roast fish in hot oven 35 - 40 minutes, depending on thickness of salmon. I like my fish well cooked and slightly crispy around the edges (no, this doesn't dry it out) so I tend to roast it the full 40 minutes. While fish is roasting, wash the spring onions, pea shoots and/or baby greens. Allow greens to dry on a clean cotton towel. Set aside. Using scissors, snip the spring onions into small circles. Catching in a bowl as you snip. Save the white root part for growing more spring onions. (see index on how to easily do this) Using your hands, gently toss and finger the cutting to loosen and separate. Set aside for garnish. About 10 minutes before fish is cooked (or more depending on your kettle) fill kettle with water and bring to rapid boil. Unwrap noodles. Place in large, heat-proof bowl, or pot, with a couple of lime leaves, if you have them. When water is boiled, pour over noodles. Cover the container. Allow noodles to soften five minutes, gently stirring with fork to separate half way through process. Drain noodles in colander. Remove leaves. Return noodles to same container. Add chili sauce. Mix thoroughly. Set aside, or plate in preparation for fish. If you want them very warm, pop into the oven, covered, for the last few minutes fish is cooking. 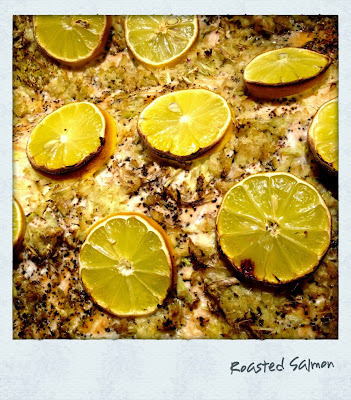 When fish is ready, remove from oven, set aside the lemon and shallot slices, and cut into serving pieces. I usually leave the skin behind, unless somebody wants it. 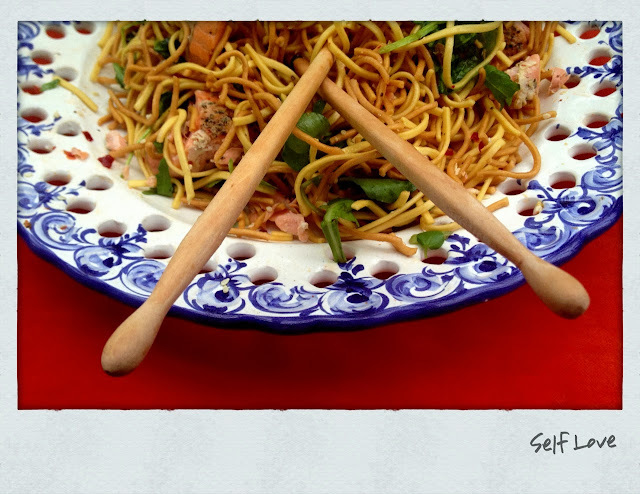 Using a couple of forks, or a good pair of tongs, plate up the noodles. 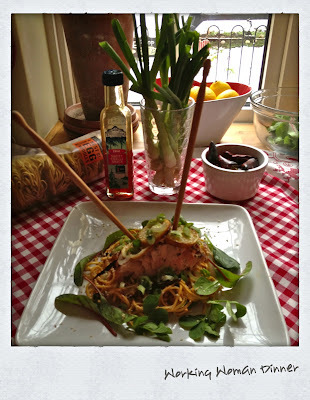 Top with the salmon, garnish with spring onion rings, pea shoots, baby greens, and a generous sprinkling crushed peanuts. Admire your handiwork. Consider serving with chopsticks. 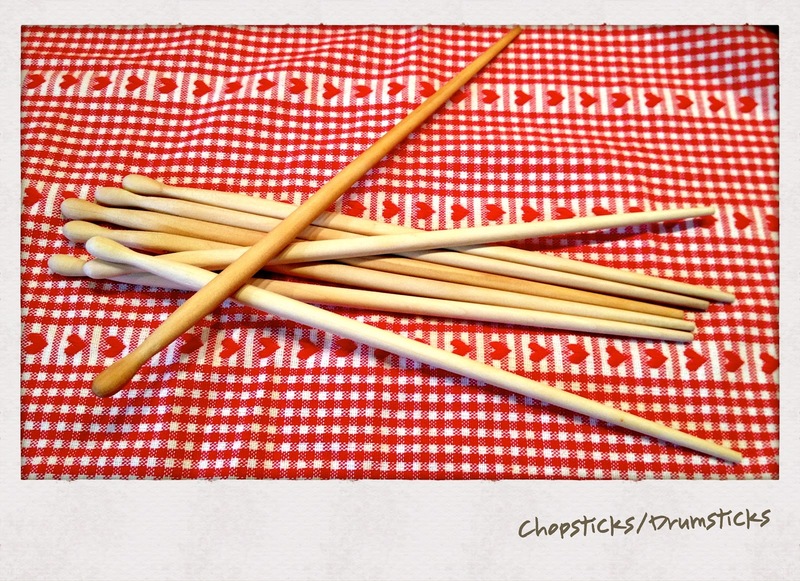 I recently bought several pair of chopsticks that do double duty as drumsticks. They're fun for bringing an element of unsuspected surprise to the table. Suggested Beverages: I enjoy offering a premium Sake with this meal, or a glass of ice cold ginger beer. Suggested Dessert: Even though I said this dinner is like getting your dessert at the same time, I didn't mean it. A bit of mango, raspberry, or lemon sorbet, with a quick shaving of dark chocolate on top, is the ideal finish here. Another satisfying post-meal offering is a pot of freshly brewed fennel tea, one of my favourite hot drinks. Keep a variety of Asian noodles on hand. If you don't have peanuts in the pantry, or have a peanut allergy, a combination of wet and dry, crunchy noodles works well. 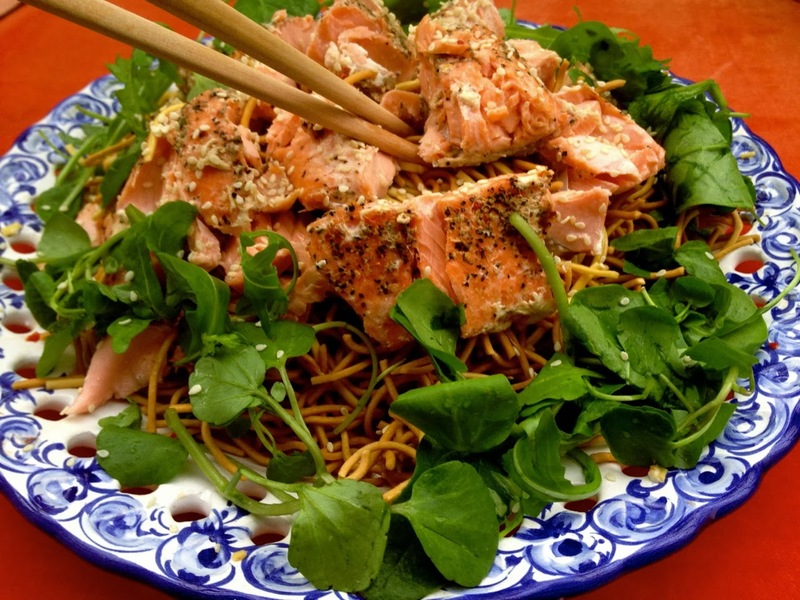 Wrap the crunchy, dry noodles in foil and warm up in the oven, while cooking fish, for about 15 minutes. Then, combine the crunchy noodles with the wet noodles and chili sauce. You won't miss the peanuts at all. If you've a bit more time, try topping the salmon with finely chopped ginger root and lemon grass. A thumb size piece of fresh ginger (after peeling) and a single stalk of lemon grass, well minced and spread over the top of the fish, along with the lemon slices, adds a wonderful, subtle Asian flavour to the salmon. For chili lovers, roast your favorite chilies in a separate pan, along with the fish. Just wash, toss in a bit of olive oil and roast away, turning once. 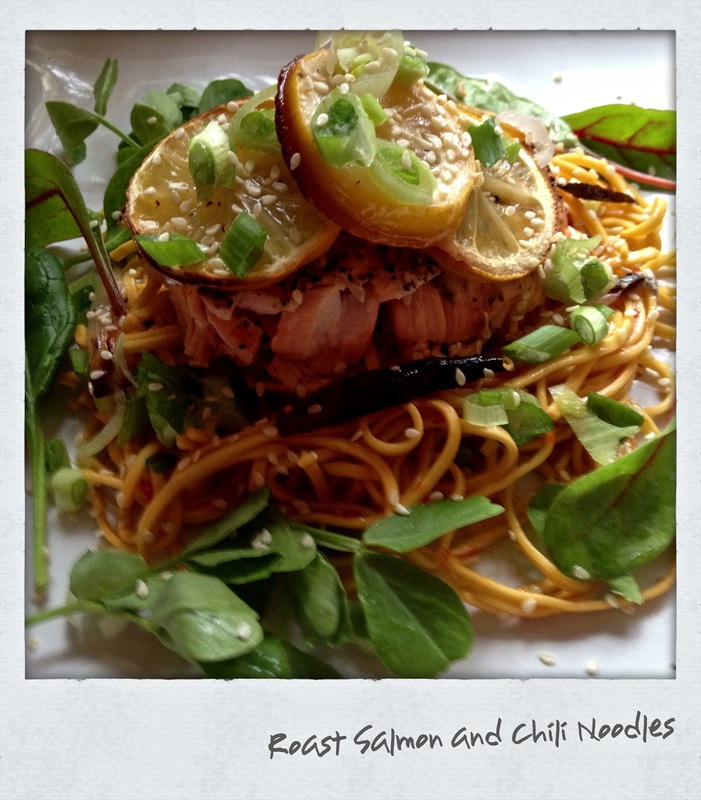 The chilies make a another appetizing garnish, as well as tasting superb with the fish and noodles. If you're making this meal on the weekend, you might be tempted to make your own chili sauce. It takes about 30 minutes and lasts in the fridge for weeks. As you might expect, I have some ideas about this. Good chili sauce is made with, no surprise here, chilies, garlic, vinegar, and sugar. Quite a bit of sugar. The heat comes from the type of chilies you choose to work with, as well as how many seeds you leave in them, as most of the heat comes from the seeds. If you don't want to use sugar, experiment with honey.